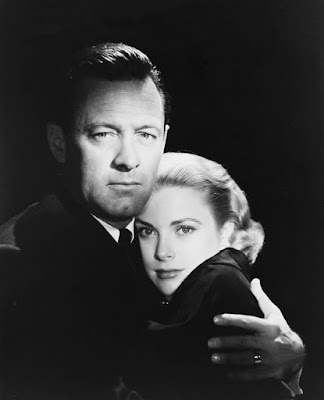 Today, I'm reviewing The Bridges at Toko-Ri (1954), starring William Holden and Grace Kelly. 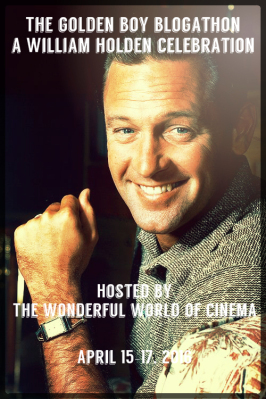 This article is part of The Golden Boy Blogathon: A William Holden Celebration hosted by The Wonderful World of Cinema. There are dozens of great World War II dramas, but there are relatively few old Hollywood movies about the Korean War. 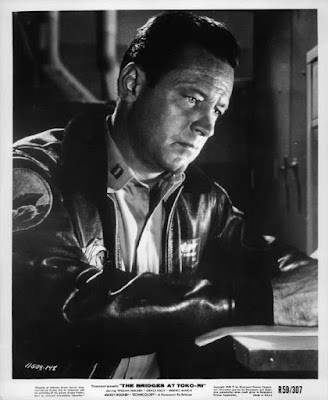 The Bridges at Toko-Ri (1954), which is one of William Holden's most under-rated films, is a powerful drama about a group of Naval fighter pilots who are assigned to a dangerous mission in North Korea. The Bridges at Toko-Ri tells the story of Lt. Harry Brubaker (William Holden), a Denver lawyer, who has everything going for him, including a beautiful wife (Grace Kelly), two adorable kids (Nadine Ashdown and Cheryl Callaway), and a successful practice. Harry was an ace pilot in World War II, and he has been called up again to serve in the Korean War aboard the aircraft carrier, USS Savo Island. Harry and his fellow pilots are assigned to destroy two strategic bridges that make up an essential supply line for the North Korean army, although the extremely risky mission will almost certainly result in the death or capture of some of the pilots. The Bridges at Toko-Ri is an adaptation of a James Michener story, which was published in a 1953 issue of Life magazine. The story was based on Michener's time as a correspondent aboard two aircraft carriers during the Korean conflict. Michener was impressed with the courage and skill of the men he covered, and he based several of the story's characters on real-life people, including the roles played by Holden and his co-stars Fredric March, Mickey Rooney, and Charles McGraw. The mission to take out the bridges is also based on two real-life bombing raids, as is the rescue attempt afterwards, although the fate of the helicopter crew was different (the two men were captured by the North Koreans). Paramount Pictures quickly snapped up the rights after Life published Michener's story, and Holden agreed to star on the condition that the story's grim ending wasn't changed. The movie was filmed on location throughout Korea and Japan, including at the Yokosuka Naval Base in Japan and aboard an aircraft carrier on the Yellow Sea. The Bridges at Toko-Ri won the Academy Award for special effects and the film's many aerial battle scenes are both intense and immersive. The camera is placed from the pilot's point of view during the crucial bombing run, which gives the movie the feel of a modern video game. No matter how impressive the special effects, the real strength of The Bridges at Toko-Ri is the human element of the story. Rooney is engaging as a blustery Irish-American chopper pilot who can't seem to stay out of a fight, and March gives his usual fine performance as an admiral who has to send the men under his command out to die in a conflict that he regards as the "wrong war," but it is Holden's courageous performance that really makes the movie outstanding. Holden, unlike many other leading men of the studio era, wasn't afraid to make himself look less than noble on camera. The role of Joe Gillis in Sunset Boulevard (1950) was turned down by several established stars because of the more unsavory aspects of the character's relationship with silent star Norma Desmond (Gloria Swanson), and it's probably a good bet that if someone like John Wayne had starred in The Bridges at Toko-Ri it would be a much more gung-ho movie. Harry, as portrayed by Holden, is certainly the Navy's golden boy -- he looks mighty handsome in his uniform, and the admiral, who favors him, lets him flout Naval regulations by bringing his family to Tokyo -- but Holden also shows Harry as a man who is bitter about being forced to leave his nice life in Denver for another deployment. Harry, who has more experience than the other pilots, understands that their mission is extremely risky, and Holden portrays him as a man, who is, quite frankly, frightened about what he has to do. In many ways, The Bridges at Toko-Ri is a stealth anti-war film that eerily predicts America's role in the Vietnam War. The futility of the military's "peacekeeping mission" is dramatically outlined in the movie's tragic final scene, where the Navy's golden boy, who has so much to live for, fights for his life in a muddy ditch in Korea. 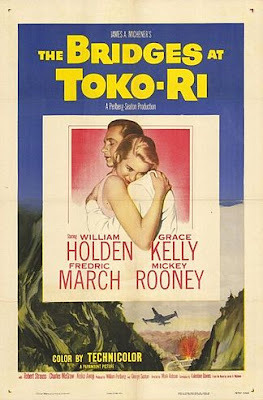 The Bridges at Toko-Ri is available on DVD and video on demand. Awesome article Amanda! You give a real breath of fresh air to this indeed very underrated film. I agree, Holden's performance in this film was very courageous and he truly is the central force of it. And the special effects are amazing, especially for 1954! Thanks! I enjoyed writing about this movie. Excellent post! Been years since I watched, but you make me want to revisit this. If I remember correctly, I think this was Bill's favorite film. I didn't know it was his favorite movie. He had every reason to be proud. This is one of my favorite war movies--very underrated, very powerful. Great write-up! Excellent piece. I covered this for the Grace Kelly blogathon, but it's really much more Holden's film - a very powerful performance. I like your point about him being prepared to take roles that other stars wouldn't, as with the hero's fear here and his character in the fantastic Sunset Boulevard, which I've just watched. Grace is good in this movie. I love her reaction in the spa scene. That would be my reaction, too. Great article and I'm glad their are other fans of this gem of a war drama. I remember being shocked when I saw the ending the first time I saw the film on TCM. This really is an under-rated movie. I wish TCM would show it more often.